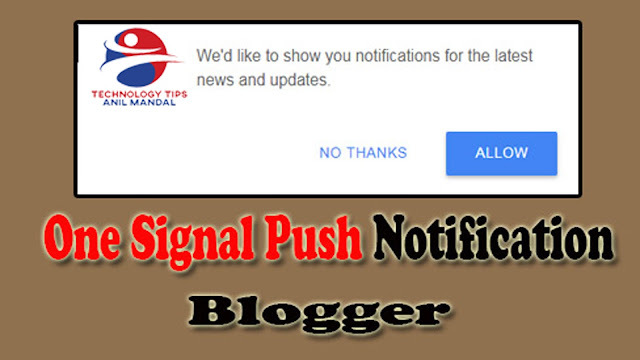 One Signal Push Notification On Blogger Blog:- Hello Friend's In today's article, we are going to tell you how to add your Blogger Blog Par One Signal Push Notification, it is absolutely free so that you can increase traffic on your website. First of all, let us know that Blogger is a service provided by Google so that you can create your blog in Free. If you do not know how to create a blog on Blogger, you can read the article on the blog. "Blogger Blog Par Signal Push Notification"
Now let's talk about One Signal Push Notification, so many people ask us today whether Blogger Blog Par One Signal Push Notification can be applied. Because earlier this system could only be installed on the WordPress Blog, but now you can also apply this service on your Blogger Blog. What is One Signal Push Notification? Those who do not know what is One Signal Push Notification? First, we tell them about One Signal Push Notification, this is a service that does a Notification Show when a visitor visits your website. In which they are asked to allow or disallow your Notifications. By doing so, people either allow or disallow your Notification. Now the question comes as to how Notification, we can tell you that this plugin / Widget whenever you publish a new post on the blog, then those people who have allowed your Notification allow them to send a notification on their browser In which your latest post has a little information like the title of your latest post. Now you get two benefits of this thing, the first people who have given your Notification permission are given the information direct of your latest post on their browser. And the second advantage is that they click on that Notification Direct to your website. Therefore, you must put One Signal Push Notification on your Blogger Blog. Let us now inform you that the Push Notification Service is a Paid Service but the One Signal Company provides this service is free and if you are a Hindi or Hinglish If you have created your blog in language then you can keep the text that is showing on this plugin as per your website, which we will tell you next. First, you have to create an account on the One Signal Push Notification Website. For which you can visit the One Signal Website and click on the Login button. Now like the image above, a popup window will open on your screen. In this window you can click on the Sign-Up button below, if you wish, you can also sign up with your Facebook, Github or Google Plus Account. can do. Now like on the screen above, on your screen a page will open, where you get the option of Add a New App. You first click on it. You will now have a pop-up window open where you have to enter the name of your app. With the name of the app, you are not confused, you can name your website because it's just the name of your One Signal Account. After this, you click on the Create button. You will now have a pop-up window open in front of the image above, where you have given some options, you have to click on the option of Web Push only. At the top you will get three options (Typical Sites, WordPress Plugin or WordPress Builder and Customs Code), you have to select the option of WordPress Plugin or WordPress Builder. Site Name:- In the first box, you have to type the name of your website. Site Address:- In the second box, you have to enter the URL of your website. We will suggest you first to open your website and then copy the entire URL and then paste it here. Now if you want to add an icon of your One Signal then you can upload it directly from your computer or leave it blank. You get the default A Bell Icon. Size: - First you have to set the size of your Bell Icon for which you have three options (Large, Medium, Small) you can select any of these options. Location:- Now you have to set a location for your Bell icon in which you get two options (Left, Right) You can select any of the two options according to your IQ. Color:- Now in Color, you have Main and Accent two options, from which you can change the color of your Bell icon with the Main option and change the color inside the Icon from the Accent option. Visibility:- On opening this option, those people who do not see your Subscription Bell will be seen again. There are some settings even after these settings, but they are not important to you, so let them remain the same and click Save Button. First of all, you have to do this on the checkbox given in front of this box so that you can edit the text of this pop-up. Such as: If you have a news website then you can write "Do you want to read Daily Latest News" or something like this that people should attract that only by clicking on Notification's Yes button. Button: You can also type in Hindi, English or Hinglish languages like Yes - No, Yes - No, Ha - Nhi etc. Now you can click on the Themes option in the left sidebar of the Blogger's Dashboard and in front of you will open a page like an image. In this page, you will find two options to Customize and Edit HTML just below the preview of your theme. Are there. You can click on the option of Edit HTML, which makes your Theme's Coding Open. Now click anywhere on the given page on the mouse and Press Ctrl + F Button from the Keyword, which will take a Search Box Show on your screen. In the Search Box, you have to type <head> and press Enter. If you do not find any articles related to Blogger on our website, you can tell us through the Comment Box or Contact Us Page. We will try to publish a Blog Post on that topic as soon as possible. Now, if you have any questions related to this topic then you can ask us in the Comment Box and you can use the Bell Icon or Email Subscription Service to get our Latest Post's Notification. Iss post ko maine bahut se bogger ke blog par jakar padh but aapke samjhane ka tarika sabse behtar hai…Rikki Sir, aapka bahut – bahut dhanyabad ye post share karne ke liye…..
bahut hi achhi jankari aapne share kiye hain. maine bhi successfully apne blog me add kar liya thanks ..